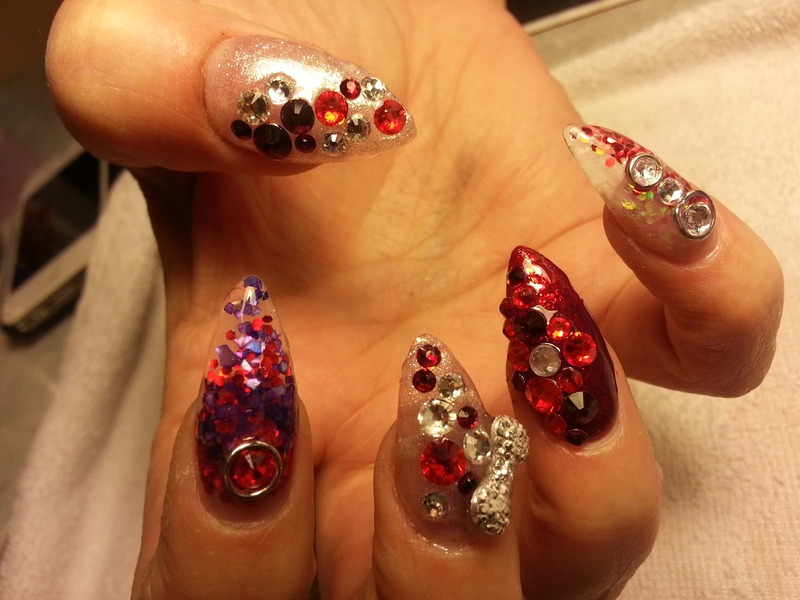 The evolution of nail art over the years has consistently grown my passion for the industry. The newest trends have allowed me to push my creativity to the next level, many times trying to find ways to become a trendsetter myself. Having an artistic medium where that type of creative freedom is welcomed and encouraged has continuously fueled my passion. I’m excited for this competition and I am looking forward to the challenge. 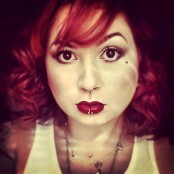 When I started thinking of a “Dashing Diva”, I envisioned a gorgeous woman from the 1920s. I then started to focus on her hair, specifically her finger wave curls. 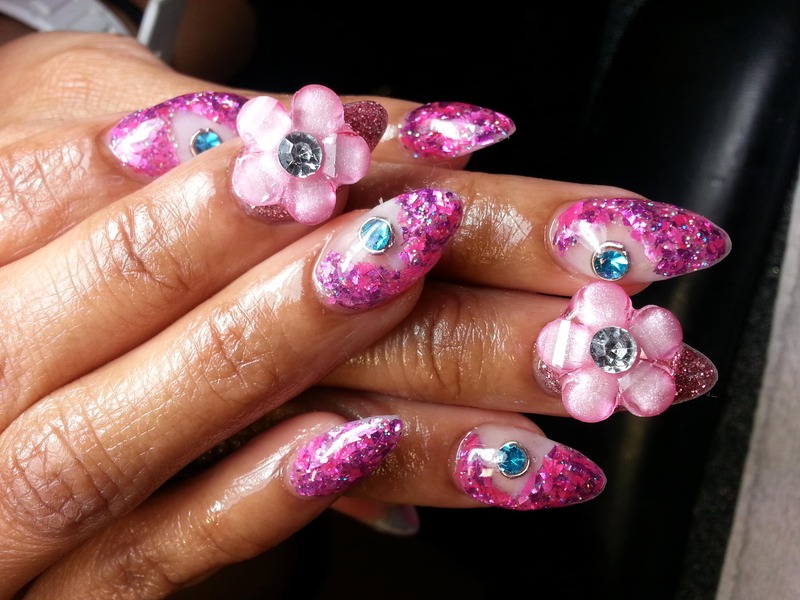 I knew I wanted to create curls and swirls on the nails and incorporate my favorite color purple. 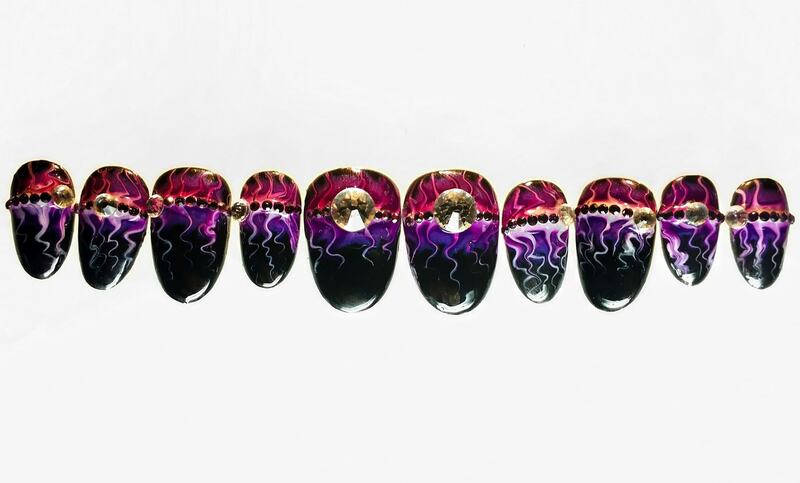 I wanted an intense eye-catching design that would appeal to a wide audience and utilize stones in a pattern that could be easily mass produced. I chose my color base and then began testing the design. Once I had the process down, I began applying the gel to the nails. I painted the base deep black and cured the gel. Next I placed a large dot of pearlescent pink, followed by a smaller dot of deep purple, and finally the smallest a dot of bright white. I followed the pattern on each nail. 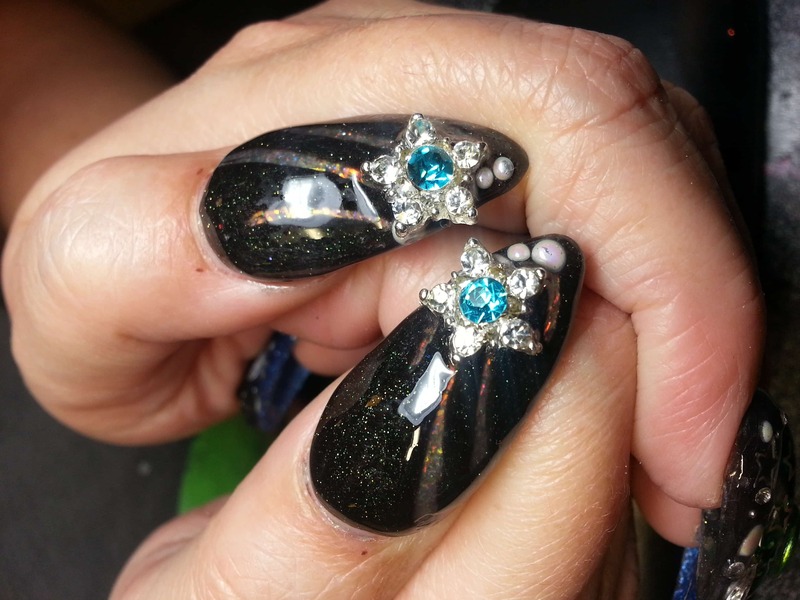 Then I placed the jewels in an alternating pattern that would allow the customer to pick and choose her favorite nail design to apply to each finger. 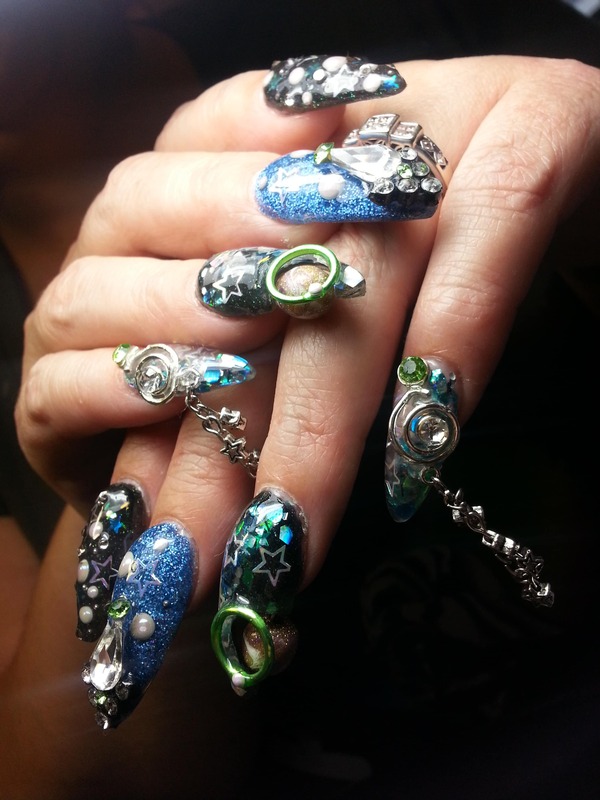 Click here to see a video tutorial of how Marisol created these nails. While looking at the ad campaigns from Entity Beauty, I was immediately drawn to the elegance of the nails and designs. The two campaign ads that resonated strongly with me were the wings and calla lilies. The classic hues of pink-and-white stood out against the softness of these two designs. I imagined the 10th anniversary party would be a fashionable, dignified event, so subtlety was important. 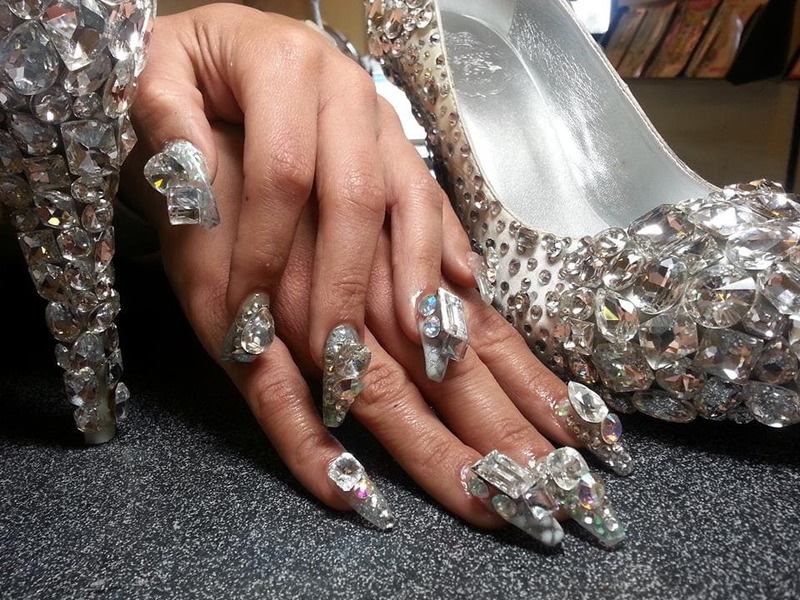 This reasoning led to slight nuances of detail, with the single calla lilies and limited use of crystals on the nails. I wanted to capture the timeless, modern look and add a twist. To do this I incorporated my reverse French technique on two nails. The wings really spoke to me so I wanted to make them the artistic focal point on the rest of the nails. My vision of the attendee of this event was a chic, trendy socialite who has refined tastes. She likes the finer things in life, but doesn’t want to draw too much attention to herself. I feel my design is the perfect embodiment of this personality type. 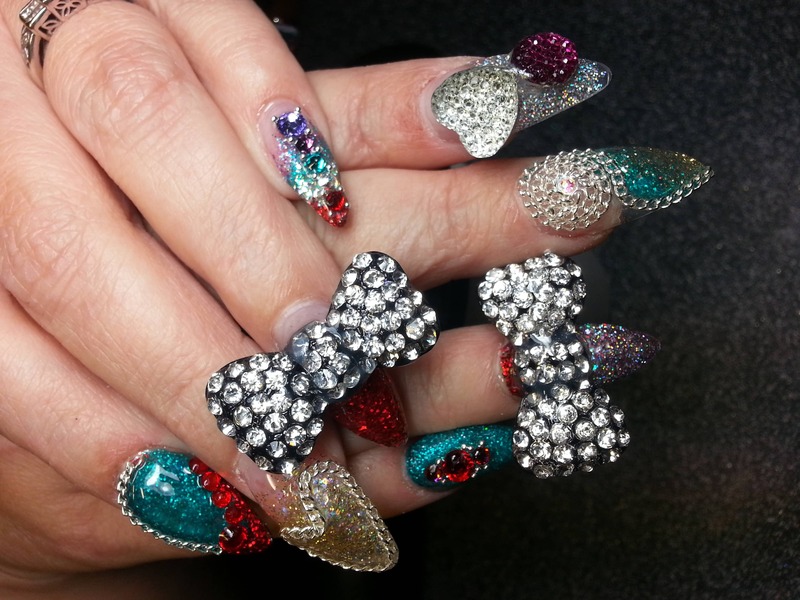 Click here to see a step-by-step tutorial of how Marisol created these nails. My week 4 design is inspired by Mexico. This is the homeland of my father. I wanted to include the most important aspects of the Mexican culture and ensure there was plenty of color! To the far left, I created a Dios de los Muertos skeleton on one nail tip. He is wearing a bandolier and a colorful sombrero. The skeleton face has jeweled eyes that pop against the hand painted face. Next to the skeleton there is a colorful boot filled with roses. I also created a small bottle of tequila and placed it under the boot – Mexico is known for their tequila! The three nails in the middle are painted to signify the flag of Mexico. I made sure to accent this piece with matching jewels to make it pop. Finally the nail on the far right has a colorful plate full of tacos, beans, salad, and jalapeños as well as a pair of maracas. 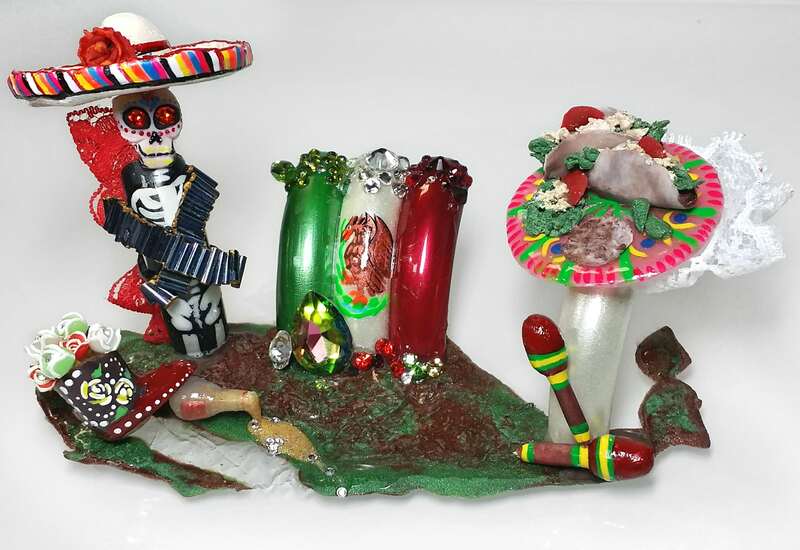 To me, food represents the importance of family and fellowship while the maracas represent the history of music. These two go hand in hand in Mexican culture. 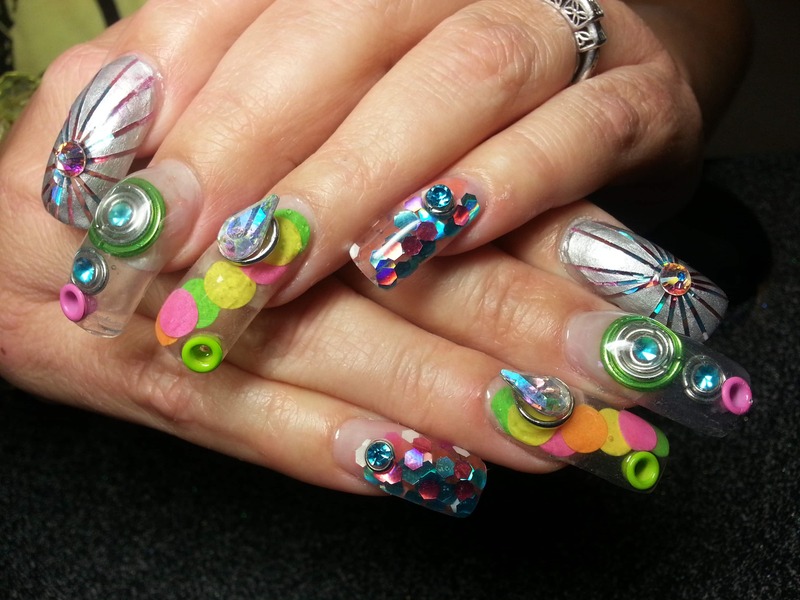 Click here to see a video of how Marisol created these nails. When I received the assignment my first thoughts of something LA-inspired went to the red carpet, the Hollywood sign, or Disneyland. I tried to determine what would best show the essence of Los Angeles. I also recalled the critiques from my previous two challenges: What can I do to show Los Angeles and include suburb detail along with a unique design? I knew I wanted to show a modern or even futuristic view of a French. 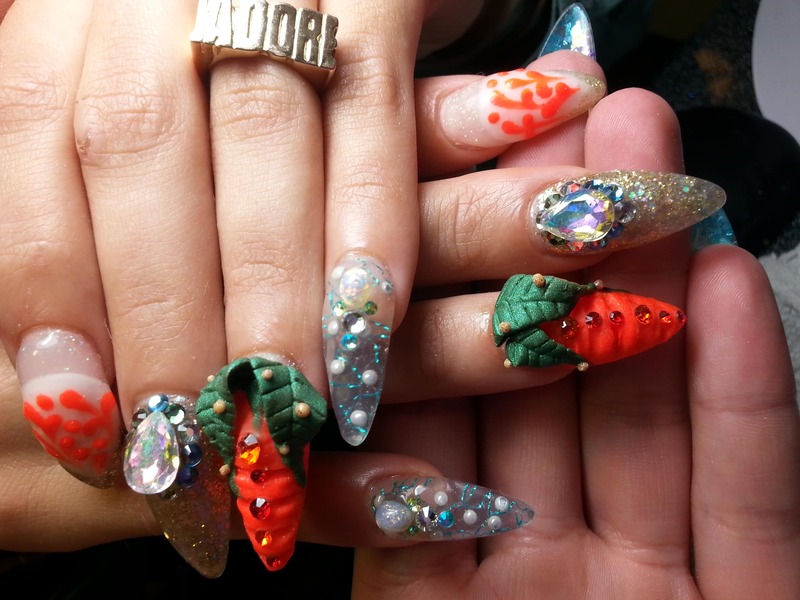 I feel that having hand painted nail art is a norm our ever-evolving nail industry could see in the future. But what theme? I realized that there are so many key landmarks that make up Los Angeles. I pulled inspiration from my close friends who visit Los Angeles frequently. 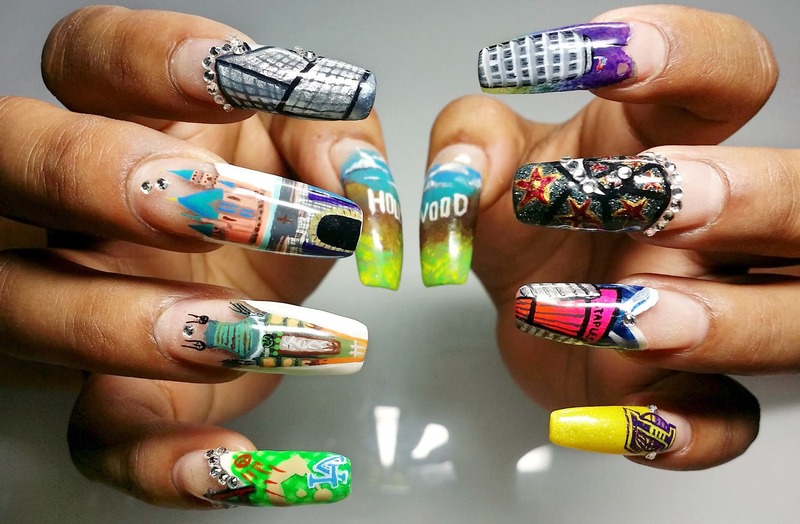 I made the decision to show the key Los Angeles landmarks on each nail tip of a French manicure. I feel that this set shows all the wonderful places that make up Los Angeles. The key to successfully representing these iconic buildings and landmarks was in the detail. The key is to put just the right level of detail without over-working the art. To get the small line details on such a tiny surface, I used a lighted magnifying glass and a small fine-tipped paint brush. My design has a mermaid queen rising from the ocean along with several of her sea creature friends. The creatures include a shell with pearl, yellow tang fish, lobster, starfish, and sea horse. First I applied a deep blue custom gel to all 5 nails. I used a swirl pattern to mimic the deep blue ocean water. Next I created the mermaid by applying clear gel to a small mermaid doll mold. I then cured this gel under a UV lamp. I carefully removed the gel form from the doll. 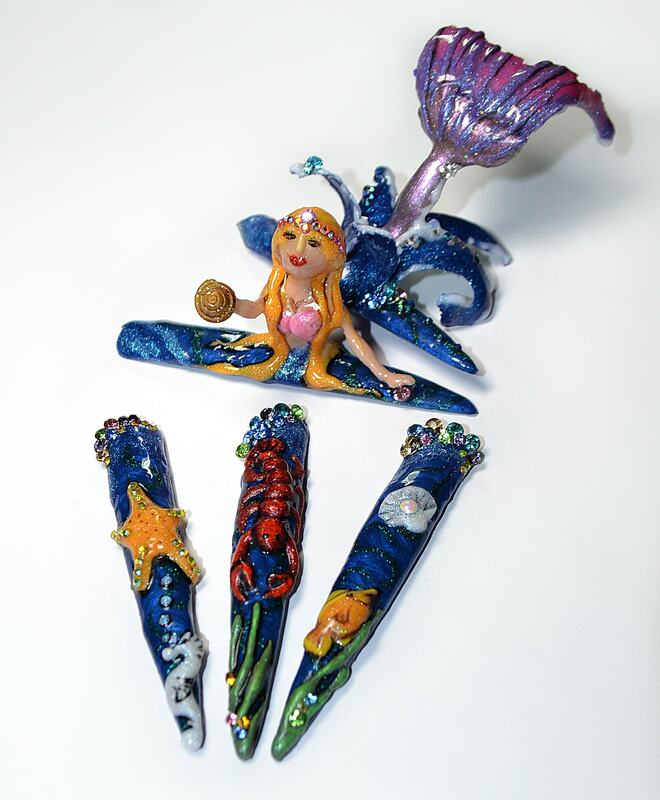 Once I had all of my pieces, I used gel to fuse them together forming the mermaid queen and secured them to the nail tips. After the mermaid queen was secure on the nail tips, I used gel to paint all of the details. To create the mermaid head I used the tip of a plastic dropper as a mold. I dipped the dropper in clear sculpting gel and let it cure under UV light. As the form was curing on the mold I carefully spun the gel to create the mermaid’s facial structure. Again, after the head was attached to the body, I used gel to paint all of the details. To create the splash of the mermaid queen’s tail, I created waves by placing gel on a small curved glass jar. I then secured these pieces to the mermaid tail. Finally, I used gel to create the sea creatures. Once cured, I went back over with paint to enhance the details of each creature. 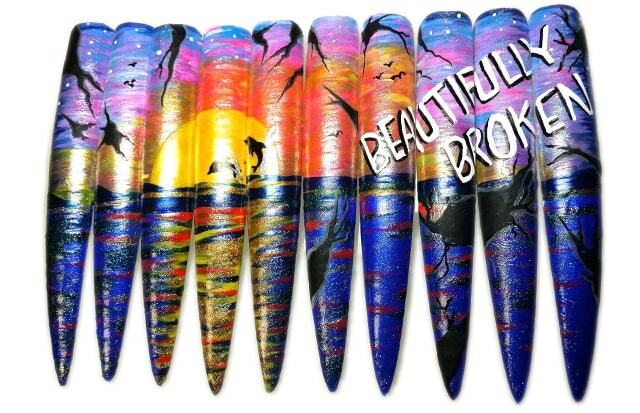 The caption I chose to represent on my nails is “Beautifully Broken.” This is something that has been my personal motto for several years. To me it represents the fact that we are all beautiful despite the flaws we have that may make us feel broken. The characteristics we have that make us feel broken are the features that make each and every one of us unique and give us our own individual fingerprints in this world.